Dhanbad: Junior doctors attached to Patliputra Medical College and Hospital (PMCH) have reportedly gone on strike protesting against lathi charge that was conducted on them on Thursday. The incident happened while they were counter-acting against the relatives of the patient who lashed out at a fellow junior doctor, alleging medical negligence. The contingent of doctors went to Deputy Development Commissioner of Dhanbad, Kuldip Dwivedi and asked for necessary action against the cops involved in the lathi-charge. The Telegraph reports about the incident that occurred on Thursday morning when the relatives of the patient, Janvi Kumari aged 4, who died while being treated for meningoencephalitis at the hospital, allegedly thrashed junior resident Dr Upendra Oraon blaming him of medical negligence. After noticing the attack on a fellow resident, the other junior doctors launched a counter-attack on the relatives of the deceased patient. A team of Saraidhela police led by OC Niranjan Tiwari reached the hospital and managed to hold back the parties from attacking each other. However, the situation didn’t calm down, with heated hight ensuing between the police and the doctors, after which the police held lathi charge as the defense. Finally, the senior officials of PMCH, including principal Kameshwar Biswas and superintendent Siddharth Sanyal, and DSP (law and order) Mukesh Kumar took the matter into their hands and brought the situation under control and calmed down the furious parties. He pointed out that the junior doctors have not given any written statement about the strike. “But they have informed us verbally. OPD services have been affected, but the emergency services remain normal”, he added. 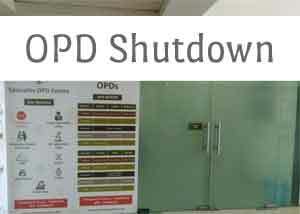 As a result of the protest, the Out-patient Department (OPD) services of the hospital has been affected. THE INDIAN PUBLIC CONSISTENTLY DEMANDS THE DIRE NEED TO BE TREATED BY NEEM-HAQIMS JHOLACHHAAPS….! Attacking a doctor on duty should be made a non-bailable offense. Strict action should be taken against the elements involved in the attack on doctors and it should be well publicized on media to serve as deterrent. Also government should give ads in TV and media etc warning against attacks on medical personnel and establishments and the strict provisions of law which can be applied to the offenders. I think this needs to be widely publicized by the govt, the medical associations and the media for the good of the society in general. how can a min doctor person can say negligence? When you can\’t say a advocate,, police,, magistrate or such workers then why only doctors ? police as usual cones after attack,, any action take n.. I am reminded of news that lay Ch chars Singh suspended a Dm and do of a Zola. There was much hullabulla but he was stricter and didn\’t cow down. Till he was CM up there was calm in up.